He’s got a fire-in-the- belly and it’s burning ambition that’s causing it. Having run away from taking over the family business, Delhi’s Vikram Jaisingh (Farhan) arrives in Mumbai for making it big in films. We see a roomful of wide-eyed students in Nand Kishore Acting School, (an obvious and rather unflattering reference to the customary first step for most hopefuls -- Kishore Namit acting school). A tall aspirant has a pronunciation issue—he says "Khabsurat khaaab” for Khoobsoorat Khwab and you’re smiling already. But you really laugh when the teacher (Saurabh Shukla), an impossible ham and the worst actor in the room, displays how to enact a simple scene. Still, his often contradictory advice is lapped up the eager students who don’t know better. Vikram lives typical struggler-style in a nondescript building, sharing the room with two others –an assistant director with Mahesh Bhatt and a struggling actor who has earned a name in theater and is somewhat content with his idealism. But Vikram dislikes the word `content’; a bit of a hustler, he falls for neighbour Sona (Konkona) who’s doing fairly well with roles like the “dead sister ki saheli” and is in talks for plumper projects. In his extravagant home, Rommy Rolli (Rishi Kapoor) a Punjabi producer, as brash as he is amusing, mops his brow with a cheery kerchief, tucking it into his expensive-but-loud shirt's pocket. He is worried because protégé ( now a big star) Zaffar Khan (Hrithik) refuses his next film. Under pressure from yesteryear star Neena Mishra (Dimple) as her daughter Nikki (Isha) is debuting with the project, Rolli decides to cast a new face. Vikram is one among the many called for a screen-test, and the story is about what happens after. Luck by Chance (LBC) highlights the many quirks of the Hindi film industry, like film productions run like family enterprises. The casting process truly embodies the title of the film, as the family including Rolli’s wife Minty (Juhi) sporting blonde hair, diamonds and high heels at home, makes judgments on the aspirants over snacks. She worries about her husband’s high blood pressure and over playing cards with other powerful wives makes decisions on behalf of him. The director is Rolli’s younger brother Ranjit (Sanjay Kapoor with some of the best scenes) who puts incongruous scenes together because “imagination mein kuch bhi ho sakta hai”. LBC does not mercifully focus only on the stars and instead, dives deeper into the workings of the industry: assistants angling for a break, newcomers causing insecurity, creative disagreements turning ugly, inside news floating from hairdressers to assistant choreographers to side actors to gossip journalists and so on. The film nicely puts a spin on the `suits’ in corporate offices who speak about introducing an organized work culture with focus on the “property” (fancy term for script), but refuse good projects unless it has stars. Debut writer-director Zoya Akhtar revels in telling us almost all, but leaving out several things unsaid. It’s these subtleties and lack of spoon-feeding the audience about how they are supposed to feel about a character, that’s likely to affect the film's longevity and repeat viewings. Zoya uses symbolism liberally to make a point: the baaware `circus’ song being an obvious metaphor for the industry; and a character walking past several worn-out film posters on the street on deciding to abort the intention of becoming a star. The film does give the audience what it wants at times – note the mahurat shot where Zaffar Khan says dialogues like `chaand chaandni, phool khushbu’ etc. Not really used in films today, such scenes are just an extra ribbing of the industry and a few bonus laughs for the audience. The wonderful songs (Shankar-Ehsaan-Loy) are picturised lovingly – from the riotous, immediately-happy Baaware where Hrithik is in leather dhotis teamed with sports-shoes to the sweet Ye Aaj Kya Ho Gaya. Most of all, Sapno se bhare naina: so reflective of the unrequited, tearing ambition of the character sitting in an audition room with his competitors. Zoya cajoles fantastic performances from each cast member. Post Rock On!! Farhan Akhtar gives yet note-perfect and hugely enjoyable performance. Konkona is delightfully authentic. Isha Sharwani too impresses. Hrithik Roshan is marvelous, Dimple Kapadia lusciously diva-like (her outburst against an article is one of the highpoints of the film), Rishi Kapoor is perfectly gregarious and hyper, Juhi Chawla just perfect, and Sanjay Kapoor plain funny. Aly Khan as the slimy producer of small films is impressive, and the actor playing his wife Pinky gives a wonderfully credible rendering. Actors playing Farhan’s roommates are terribly impressive as well. Anurag Kashyap’s appearance as the nervous writer is telling and comic. Cleverly- incorporated special appearances by several stars – Shah Rukh Khan, Rani Mukherji, Aamir Khan, Kareena Kapoor, Abhishek Bachchan among several others – add to the fun. The film is technically superior: cinematography by Carlos Catalan (Shaurya), editing by Anand Subaya (Lakshya), sound by Baylon Fonseca (Dostana, Rock On!! ), styling by Arjun Bhasin (The Namesake, Dil Chahta Hai etc) and art by Anuradha Parikh (Split Wide Open) and TP Abid elevate the film several notches. For a star kid making a debut film that’s pretty much a family enterprise, it’s interesting that Zoya Akhtar has chosen to make light of these very aspects. She has, instead, chosen to tell the central story from the point-of-view of an outsider wanting to get a foot in. Ironic…but what a film! Luck, they say, is an important factor in the film industry. But talent is equally important. Thoughtfully, Zoya Akhtar doesn’t rely on plain chance in her directorial debut but exhibits immense aptitude while largely highlighting the significance of fate in films. Luck By Chance is the story of an aspiring actor Vikram (Farhan Akhtar) who comes from Delhi to Mumbai to make it big in films. Sona Mishra (Konkona Sen Sharma) has been struggling for more than a couple of years in B-grade cinema and wants to switch to more meaty roles. Meanwhile film producer Rommy Rolly (Rishi Kapoor) announces a new project starring popular film-star Zafar Khan (Hrithik Roshan) alongside Nikki (Isha Sharvani), daughter of yesteryear actress Neena Walia (Dimple Kapadia). Zafar’s exit from the project is Vikram’s entry ticket to Bollywood. Luck shines bright on him as he is short-listed for Rolly’s film and selected to play the male lead. But as he gains professional fame, his personal life goes for a toss with a failed relationship with girlfriend Sona. 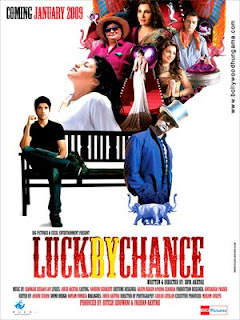 The uniqueness of Luck By Chance is the cheeky spoofs it attempts on the functioning of the film industry without exaggerating the outcome (like in Nagesh Kukunoor’s Bollywood Calling ). Luck By Chance has some of the best employed cameos which are not just stuffed in for star-value but go in sync with the script. Zoya manages to pull off satire on several actors who make you laugh at their own expense (notably Mac Mohan, Sanjay Kapoor and Anurag Kashyup). Also the film-in-film setting gives ample scope for several parody pieces on Bollywood clichés. While Bollywood is essentially employed as the backdrop of the film, it doesn’t form the backbone, with the protagonist’s character-graph taking prominence. It starts with Vikram’s self-assured struggle to get into movies, progresses with his ethical corruption resulting from fame and culminates with his remorse. However, with the rejection of his repentance, the film opts for an abrupt climax where the protagonist suddenly switches from Vikram to Sona. The movie culminates on a pragmatic note much in the Madhur Bhandarkar mould, though it evades such treatment through its run by not getting hard-hitting heavy or regressively realistic. Nevertheless, Zoya Akhtar comes up with a taut screenplay comprising of some amusingly comic-but-credible characters. The twist in the interval point is especially noteworthy where Sona loses her chance and Vikram gets lucky. The treatment continuously alternates between humour to reality bytes but at no moment gets slapstick. The narrative even covers external factors affecting the film industry comprising of acting schools, drama-theatre, corporate studios to media houses and has interesting anecdotes on each. Anand Subaya’s editing is crisp and he makes good use of montage mixture at several instances. The production design (Anuradha Parikh) and the costumes (Arjun Bhasin, Aparna Chandra) impart a perfect Bollywood feel to the film. The imaginatively shot opening credit song deserves a special mention for paying tribute to every uncelebrated craftsman involved in the making of a movie. Right at the onset, it defines and sets a perfect mood for the film. Shankar-Ehsaan-Loy’s musical score is engaging though a couple of songs in the second half were clearly avoidable. Almost every character in the film has grey shades though not glorified to extreme extents. The movie reveals the double standards of industry people though not showing them in an outright negative light. The trivial scene where Hrithik as superstar Zafar is separated from the external world by his car’s glass window is a subtle metaphor for the confinements of stardom. The pre-interval confrontation between Farhan and his friends is another effective scene. Zoya Akhtar succeeds in extracting perfect performances from each and every member of the cast. And if you think Isha Sharvani can’t act, she is used in the film to that effect. She is not supposed to act but simply look beautiful, which she does. Farhan Akhtar comes up with a natural and confident act and glides effortlessly through his role. Konkona Sen Sharma is as dependable as always and stands tall throughout the film. Rishi Kapoor gets the looks and mannerisms of his Bollywood producer character correct and is exceptionally hilarious. Dimple Kapadia is impressive as a yesteryear actress and the doting mother of her debuting daughter. Hrithik Roshan is decent in his extended special appearance. Luck By Chance highlights how the film industry give regards to everything else but the story when making a movie and ironically weaves a fascinating story using that paradox. 'Luck By Chance', a drama focusing on the 'dream-world' of Bollywood, is the second movie of ace actor Farhan Akhtar, who won our hearts with 'Rock On!!'. The directorial venture of Zoya Akhtar, the film has an impressive cast that boasts of names like Rishi Kapoor, Konkona Sen Sharma, Dimple Kapadia, Juhi Chawla, Aly Khan, Isha Sharvani and Sanjay Kapoor. Apart from that, it also has a special appearance by Hrithik Roshan. The film will be released on 30th January 2009, under the banner of 'Excel Entertainment'. "Luck By Chance" takes us into the world of Bollywood and the strugglers who are vying to become part of the glamour industry. Sona Mishra (Konkona Sen Sharma) is one such struggler. A highly ambitious and talented girl, she comes across Vikram Jaisingh (Farhan Akhtar). A Delhiite, Vikram wants to become an actor and in the process, is ready to manipulate situations tactfully. Slowly, they start developing feelings for each other and enter a romantic relationship. At the other end of the spectrum is Romy Rolly (Rishi Kapoor), a Punjabi producer who has launched some of the biggest stars, but still believes in luck and destiny. Rolly is all set to launch Nikki Walia (Isha Sharvani), the teenage daughter of 70's superstar - Neena Walia (Dimple Kapadia), in his next film, opposite Zaffar Khan (Hrithik Roshan). However, an unfortunate event results in havoc on the sets on the upcoming film. Amongst numerous other strugglers, Vikram is also called for an audition, for the film, and utilizes the opportunity to the fullest. Will 'luck' be at Vikram's side when he tries to gain from the 'chance' destiny has thrown his way? What will happen to his relationship with Sona? The answers to these questions are not far away, especially with 30th January just around the corner.